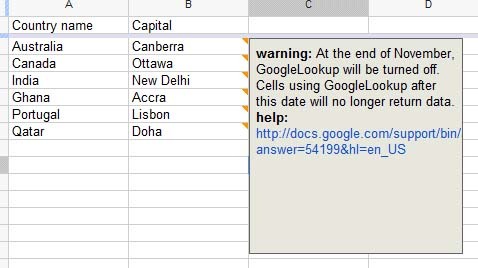 Everyone is aware of the Google LookUp function of Google Spreadsheets. It lets you find the simple facts and quickly create a spreadsheet using the Google’s data. Now, it is so sad that the function is going to be removed at the end of this month. "As of November 2011, the GoogleLookup function will no longer be supported. This function relies on technology from Google Squared, a Google Lab that's been deprioritized. To save your data, copy the selection that contains GoogleLookup functions. Then, go to the Edit menu, navigate to Paste special, and select Paste values only. When the function is no longer supported, cells containing GoogleLookup functions will return #NAME? errors," explains Google. Following is a way to use the ImportXML function to extract facts from Google Search.